What will Adam and Eve do when the sun begins to set for the first time? Is it their fault? Does it mean that God is angry? 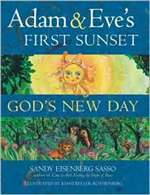 Award-winning author Sandy Eisenberg Sasso has created another profound story-a beautiful recasting of the biblical tale of Adam and Eve in the Garden-for today's children, their parents, and their teachers. This is the story of Adam and Eve's first test of trust and faith and how they learned to find hope and light-even in the dark.